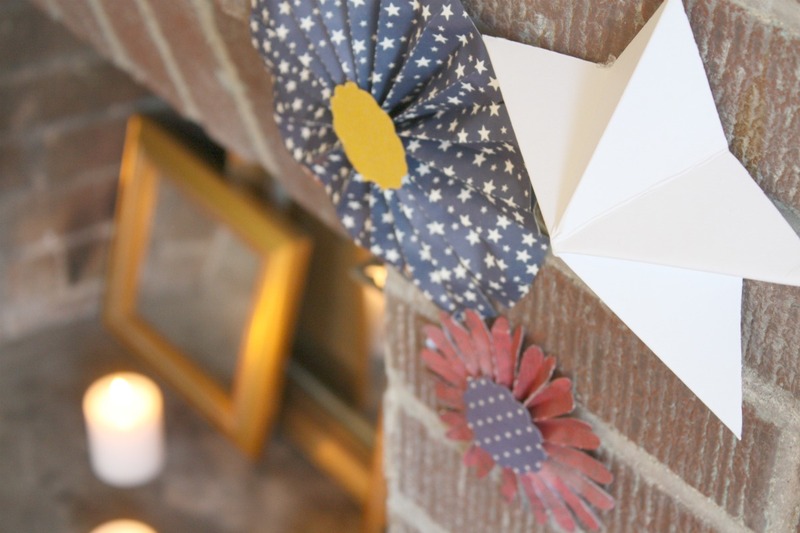 The 4th of July is right around the corner and I wanted to create some mantel decorations to move into Summer and mark the holiday. We have had some job/educational changes recently so full blown decorating had to be done on the cheap. 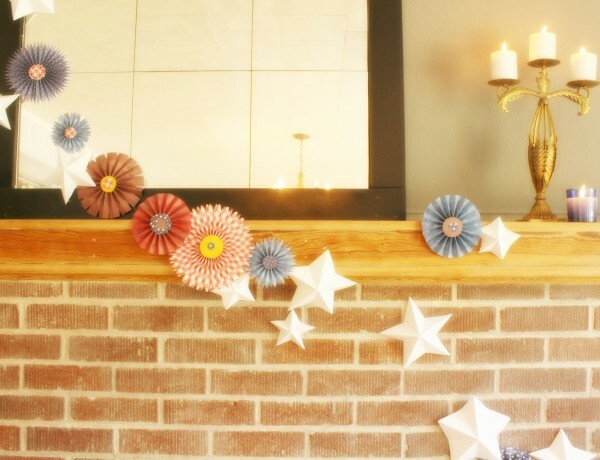 In comes stars and firework paper-craft mantel decorations. The entire thing was created with 6 sheets of decorative paper (.20 a sheet on sale) and 8 sheets white cardstock (from a giant pack so more around .10 a sheet). 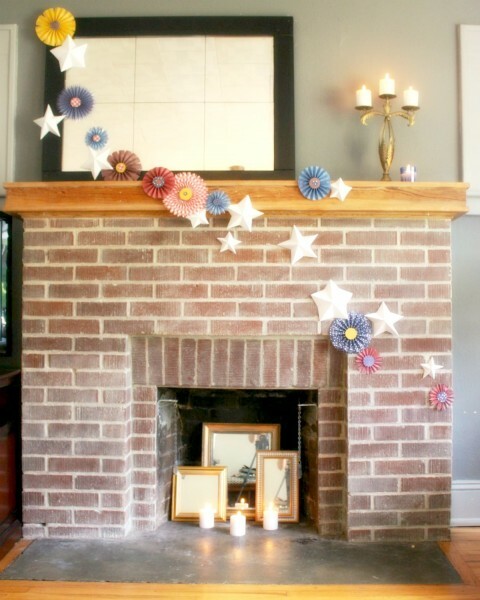 $2.00 for the new supplies put this mantel within budget. I had a few supplies, like super sticky Zots, and staging items such as candles already on hand. 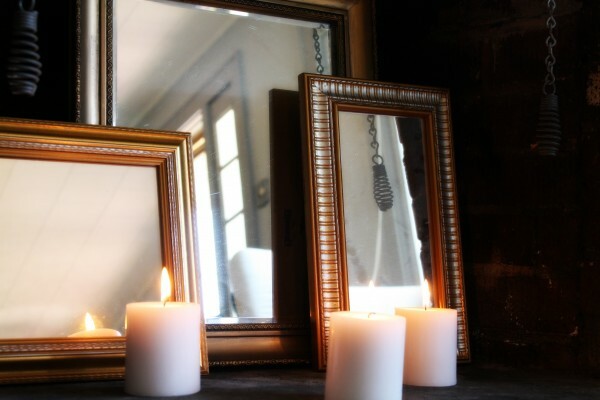 In fact the mirrors and candlestick were revamped Goodwill finds from a few years ago. The mantel was supposed to invoke a vintage Americana feeling. I used a palette of subdued reds, blues, and golds with pops of clean white for interest. Kind of a faded “old glory” theme. The gold and mirrors act to reflect a little light reminiscent of the stars. It twinkles nicely at night. The decorative paper was used to create the paper medallions to represent fireworks. This look would be easy to recreate yourself. 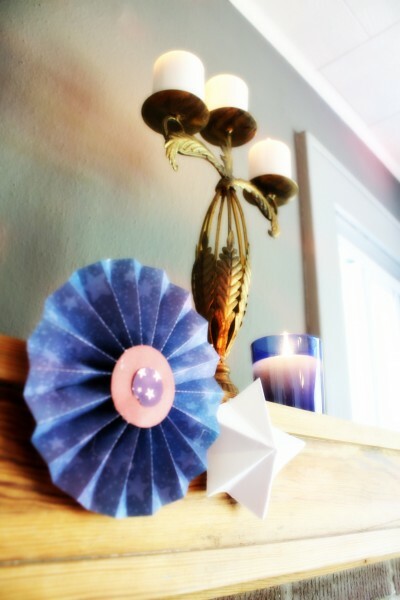 I’ll post tutorials on making paper medallions and 3-D stars later this week and next. You will find the links here when they are live. Enjoy these articles? Get periodic updates by joining my mailing list (no spam, no way, no how) or subscribing to my RSS feed. So simple and pretty,thanks for sharing.